Our Community Opera is taking shape with the draft libretto now in place and work on writing the music underway. Composer Michael Betteridge brings us up to speed. Michael Betteridge has worked on previous Festivals projects in Cheltenham West, bringing his huge experience collaborating and composing with community groups across the UK and abroad. Michael specialises in songwriting and opera, and has developed projects with BBC Philharmonic, London Symphony Orchestra, Opera North, and many more. A composer’s job is usually to write the music, which is often a solitary experience. 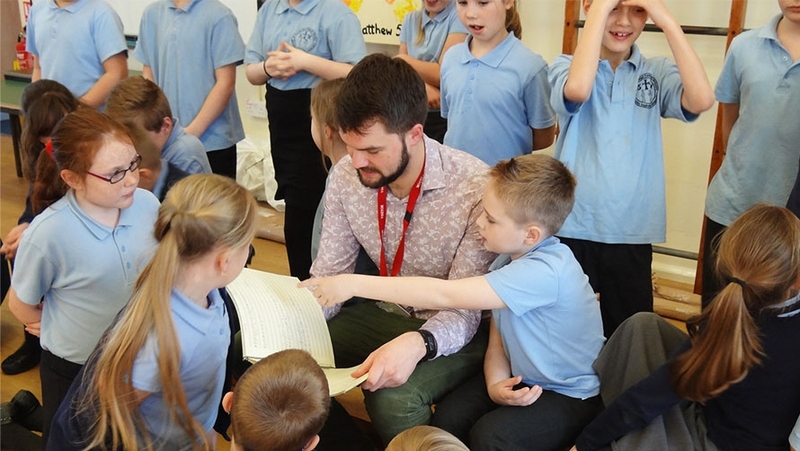 However this is a collaborative project so I will be working directly with schools and communities across Cheltenham West to gather their musical ideas and weave them into the score. Before Christmas, the three schools and our newly formed community choir Local Vocals worked with writer Miranda Walker to form the story and help with the lyric writing process. Now the draft libretto is complete and I am using these fantastic words to set to music with the various groups. With the choir I’ve been collecting ideas and discussing the mood and feel the music should take. We have longer sessions with the schools so we will be creating the music for the opera ‘on our feet’ through improvising, playing with the text and thinking about how we can use our voices in interesting ways. My big deadline (gulp!) is end of April where I have to deliver the ‘piano-vocal score’ to everyone involved – basically, finish all the melodies and a rough idea of what the orchestra will play. Then I have a month to orchestrate it for all the instruments in our orchestra. I’m always keen to make sure people can hear their ideas in the music so that’s always the challenge, but I love collaborating and everyone is so passionate and musical that I know the ideas will fly off the page! It’s always strange coming back to an area where you spent an intense amount of time some years ago. In the first instance the area seems busier than before – more shops, more people on the street. There’s also a real sense of confidence and pride, which has always been there, but now people seem more ready to talk about it compared to the last time I was here – to me anyway. I hope that people will feel that opera is an art form for everyone and everybody. I am also very excited to see the development of Local Vocals and I hope to see this choir blossom and develop long after the project. If those involved in the opera finish the project believing that their stories have been told, their ideas shared, and their voices heard (both figuratively and literally!) then I think we will have done our job.